Guitar Lessons Pensacola | GuitarLessons | Guitar Instruction | The Best! Guitar Lessons are the answer to your need for learning how to play the guitar and understand what you are doing. Are you are frustrated in your efforts to learn to play the guitar on your own? Have you grown weary of trying to learn from teachers who only teach you to copy their hand and finger movements of your “favorite song?” Grown tired of trying to learn from video guitar lessons that are difficult to follow? Guitar lessons don’t have to be frustrating or difficult. If you are seeking guitar lessons as a beginner, we can help you learn everything you need to succeed, ages 6 and up. We have the most fun and interesting methods around for learning guitar. If you are simply learning to play guitar for your own enjoyment, or you want to understand music on a professional level, we provide everything you need. We are committed to helping our students learn and succeed, while making your guitar lessons easy and fun. In Pensacola, FL, we are your Family of Music Teachers – Join Us! Guitar Lessons that are Fun & Get You Playing Fast! Our guitar teachers understand music and exactly how to help you. 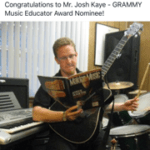 One of our guitar teachers is a 2019 GRAMMY Music Educator Award Quarterfinalist, chosen as one of the 2,800 nominees. Our professional teachers have the knowledge and experience to help you understand music and how it relates to the guitar. Understanding what notes work with a particular key, for example, leaves you free to create and improvise more effectively. Movements of another guitar player’s hand and fingers yield a limited amount of understanding and growth. In addition, most DVDs and videos never seem to capture the correct camera angle to fully explain what’s going on with both hands at the same time. We offer the best guitar lessons in the Pensacola area. Our Lessons aim to have you Reading Music & Playing the Melody Lines of Rock Tunes, Accompanied by a Full Band Soundtrack, By the end of the first lesson! Even if you have, absolutely, no prior playing experience, we will help you make it happen. It doesn’t get any easier and fun than that! Get professional results regardless of your skill level or goal. Whether you are interested in learning to play the guitar like a pro or simply want to learn the basics, Ron Kaye’s Music Instruction’s private guitar lessons allows you to learn at your own pace. Our lessons implement structure and techniques which have been proven over the last century to produce top results. Each student’s lesson is tailored to their musical ability and interests. Play your favorite songs, and learn to jam. Join our band and learn to improvise on the guitar. As our student, you will learn to read music and understand what your doing on the guitar. You can learn to play popular guitar styles like Rock, Classical, Jazz, Folk, Country, and more! Our Instruction also allows you to perform for others, if you’re interested. Ours is a fun, low pressure environment. Guitar lessons that give the the key to becoming the guitar player you want to be. Our professional instruction includes a thorough understanding of music theory. You will understand the guitar fretboard. We will help you gain the skills to play your favorite songs and understand what’s going on. You will learn to jam. You can create and write your own music. Learn to improvise tastefully and play differing styles of music. Your experience can include sitting in and performing with other skilled musicians. Play steady time and play the music and styles of the giants in music. You will be able to gain a foundation to teach yourself secondary instruments. Think about it – In a half hour lesson, you come in, tune up, exchange pleasantries, and you have just eaten up close to a third of your lesson time. In an ideal world guitars wouldn’t need tuning and students would be able to tune up in seconds, but that’s not reality. The amount of focused lesson time accomplished in 20 minutes as compared to A Full Hour – AT THE SAME PRICE is substantial. We teach Full Hour Lessons and we get awesome results! Looking for a Guitar? We sell New Guitars!